I think I'm going to start a series on people (Naija, African, and maybe others) who are doing things I think are great/inspire me/ I admire/ so on and so forth..... The first intallment will be: Ms. Olamide. This weekend (Saturday January 23, to be exact) the African Student Association of Michigan had and excellent leadership conference. Click here to read a great post about it. She said that on her first day, she walked into the class room after class had started, kids giving her strange looks. Another student walked in a little after she did and was about to sit next to Olamide, when another classmate suggested that make a different choice. "Dont sit with her; She's from Africa," is what Olamide told us the fellow student said. I wanted to go back in time and give the person a good slap. This cold reception would have been enough to make anyone hide in their shell and count the days until graduation, but not this chick. "My own confidence in myslef was way up there,"she said. It wasn't long before she started getting recognition for excelling in classes. She also began to join all kinds of school school clubs: swim team (without knowing how to swim; she learned on the team. lol) track, badminton, drama, dance tennis....In short she didn't let the initially intimidating situation stop her from shining. Right now she's doing a lot: she's involved with the Yoruba Youth Corporation, her website olamildentertainment.com, another website speakup9ja.com, writing poems, skits, songs, designing websites for others, and so much more. And she's humble too. I gots ta give props where props are due. You're going places girl. Keep on! Today is Martin Luther King Day, and unlike years past when I was mainly just grateful to have a day off from school, I am truly in awe when I consider a man like Dr. Martin Luther King Jr. His convictions were so strong and he proclaimed them so fearlessly, even knowing that he was risking his life; but he didn't care. He didn't back down. He didn't stop. One useless excuse for a human being couldn't take it and he shot Dr. King. However, as I wrote in a speech on the subject a few years ago: the bullet that took Dr. King's life did not, because it could not, take his dream. The Reverend King was definitely an instrument of God, used to forever change the minds of Americans into believing that equality was possible. He is certainly not the only one who deserves credit, but he is definitely among the greats. Every country in the world needs a Dr. King. I thank God for giving us ours. So I went to the Dr. Martin Luther King Jr. march here in Detroit. The march started at the high school named after the Reverend and there were about 200 to 300 people there. The march took about an hour and a half and took us a few blocks in the area around the school. It was really an awesome time. As you can see, we wore traditional Nigerian head gear to represent our African heritage. 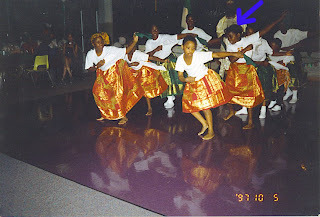 That's me in the pink gele if you can't tell. People seemed curious to see who "those Africans" were. Hahahahaha....... A couple of people took pictures of us. I personally think it was a great way to show solidarity between Africans and African Americans. It shows that we recognize greatness from wherever it comes. Anyways, the walk was a great way to remember Dr. King. May his legacy live on. And in every corner of the world, may more like him rise to change the human race for better. Amen. One of my favorite renditions of "Lift Every Voice and Sing." I hate seeing stories of devastation in the news. I have a tendency to internalize them and it makes me feel sad for a long period of time; tears are not uncommon. So at first, I tried to avoid watching too much of the news on the earthquake in Haiti. But of course, my curiosity and heart for the human race can't let me ignore it. There's not really much I can say in the wake of such pain and suffering. Haiti was already a very poor country, the poorest in the western hemisphere, from what I heard. This earthquake devastated an already struggling country. For me, the worst part is seeing the massive piles of bodies, many of them unidentified by loved ones, dumped in mass graves. It's not that the people doing this don't have any compassion or respect for their fellow humans; it's just that they have no choice. Right now, they are just trying to survive. Also, seeing people in makeshift hospitals trying to get medical treatment, knowing many of them will die, is heartbreaking. The most encouraging part is seeing the videos of people on CNN trying to let their family and friends know that they are still alive. Also, the database on cnn.com of missing and found people is truly amazing. I love it when I hear of one more story of someone who found a missing loved one because of video on TV or information online. I think this system is the first of its kind; it will go down in history. Also, the rescue teams who are still pulling people out of rubble are doing great work in their heroic efforts to find those who might still be alive. I was fascinated when I saw troops of people marching through the city, singing and clapping, trying to keep spirits up. This also truly amazed me. I haven't every seen anything like that in my life and I think it says some very positive things about the Haitian people. All I can say now is, pray for Haiti. Donate to charities that are doing the necessary work there. God is great. Let us not doubt what He can do through us. Oh say can you Lift every voice and Arise oh compatriots? As youngsters, most of us learn our country's national anthem. I vaguely remember learning the American national anthem"The Star Spangled Banner" sometime in elementary school. Around the age of 14 I was in my 'black power' phase. Hahahaha......I was reading every piece of African American literature I could get my hands on. This is when I learned "Lift Every Voice and Sing" the black national anthem. I loved the words of this poem-turned-song and I made myself learn it. But just a little while ago (maybe a month and a half) I began to realize, I don't even know the Nigerian national anthem! Well, not all of it, at least. I knew the first three words (Arise oh compatriots), the last two words (Peace and unity) and the general tune. I even asked my mom, but she hardly remembered herself. So I took matters into my own hands. 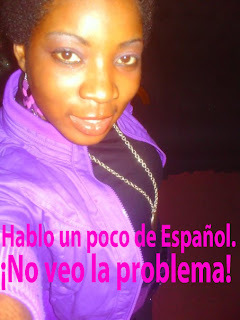 As a Naija American girl, I felt that I must. I looked up the lyrics on Google and found videos of the music on Youtube. Now I know the anthem, and I think its a very beautiful one. It's a call to action; short, sweet, and to the point. From what I see, it has two verses, but I've almost always only heard the first one sung the few times I've been somewhere where it was sung. Of the youtube videos that I found, my favorite version is by Beyonce, of all people. Imagine that. This akata woman dey come for Naija and sing anthem well pass any otha person. Hahaha.... I'm really not a big fan of hers, but I love this version because she puts her own style into it with that amazing voice!